Gnomes, Pirates and Purple Beer. Geocaching is an all-year-round hobby for many but as soon as the better weather appears we all look forward to going out to play. If you are looking for some entertainment for the kids during the holidays or a vacation with a difference then read on. 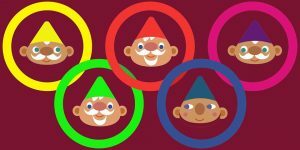 For the last 3 years, a group of geocachers in the Cheshire area have organised a fun event and this year they bring us The Fourth Annual Gnome Games – GC7D5WX. The games take place on the May Day bank holiday, 6th May 2018, at Shay’s Farm, Shay’s Lane, Tarporley, Cheshire CW6 9EU. Click on the link above for all the details and to log your ‘Will Attend’. Also, on the Friday evening, the team will be going to the Shrewsbury Arms, just a 600m walk on a footpath or a short drive away from Shay’s Farm. This event is called ‘Chillaxing again in Cheshire‘ – GC7HYBP. Once again, click on the link for all the details and to log your ‘Will Attend’. The plan is to sit outside on the patio or in the beer garden as it will be a warm summer’s evening (I’m told it’s always warm and sunny in Cheshire!) but should that not be the case, then we’ll be inside. WELCOME TO PIRATEMANIA 11 ! This year’s event will be held in Dalby Forest, North Yorkshire, with the permission of the Forestry Commission, England, from 10 a.m. on Saturday 28th July until 8 p.m. and beyond. It’s another fun packed event, ideal for all age groups and you can bring your geohound too. Food and grog will be available in port and there will be lots of new caches to find in the area. There are easy walking routes for little feet and more challenging ones for the ARRRdened treasure hunters! 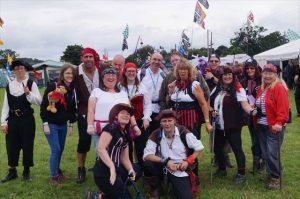 Piratemania is officially England’s biggest annual Geocaching event. The whole ethos is good, honest piratey fun for all ages. The first event in Europe to have achieved Mega status through organic growth, it’s a testament to each and every pirate that attends that we keep on growing, year on year. Expect the unexpected! The true spirit of Piratemania is best enjoyed in full pirate clobber, in a tent or caravan, with a glass of rum in your hand! Click here for all the details of Piratemania 11 and don’t forget to log your ‘Will Attend’. Every year the local organisers of the UK Mega choose a colour theme for their events and the Yorkshire guys have chosen PURPLE. So it is no surprise that there will be PURPLE BEER available in the beer tent! The Yorkshire Mega committee wish to showcase the best Yorkshire has to offer, from a spectacular coastline to remote hills alongside great hospitality and fun events throughout the week. There will be events in Whitby, York, Harrogate, Ilkley, Fountains Abbey and Ripon plus a few more. Camping available from Monday 30th Jul to Monday 6th Aug. Marquee alongside the camping area for evening entertainment. Local brewery providing liquid sustenance each evening. Hot food / drink stand all week with themed evening catering on selected evenings. Daytime events each day throughout Yorkshire. Yorkshire Day (1st Aug) celebrations. Here is a list of all the events mentioned above. A full list of events can be found on the Geocaching Association of Great Britain’s (GAGB) website. Geocaching, Mega events GAGB, geocaching, Megaevents. permalink.